Chanderi is a town of historic importance right from the time of Malwa Sultans and Bundela Rajputs, who ruled the region in 15th and 16th century. Surrounded by exotic hills, lakes, and forest, this attractive destination is incredibly famous for Chanderi saris and historic monuments that draw a large number of tourists to this place every year. Also, the great Jain monuments and their fascinating culture make Chanderi, one of the most preffered tourist destinations in Madhya Pardesh. There are many things that boost Tourism in Chanderi like Chanderi Fort, Chanderi museum, Jain palaces, and exquisite lakes. Chanderi town is located in Ashoknagar District of Madhya Pradesh on the borders of Bundelkhand & Malwa, whose history takes you back to the 11th century. The town is full of historic landmarks, dating from the 11th century to the 18th century and has witnessed both good and bad times. 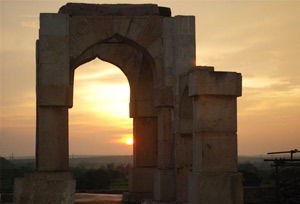 All the three religions, Hindu, Jain, and Islam flourished in the town in bygone years. Chanderi is extremely popular among historians and traders, involved in hand loom cottage industry business in making sarees, salwar suits, and other dress material. Your trip to Chanderi is incomplete if you have not visited its archaeological monuments, built during the different periods. Around 1200 baolis (step well) were constructed within Chanderi that attracts thousands of Jain pilgrims from all over the country. 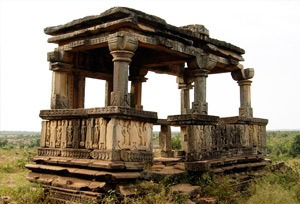 There are approximately 375 monuments in the town, a large number of 9th and 10th century Jain temples, a number of Jain palaces, making Chanderi the main centre of Jain culture. Another important attraction in Chanderi is hand-woven Chanderi saris, which is widely popular in and around the country, especially among women and traders. Chanderi is located in extremely healthy climate in the valley of the ancient Betwa River in Madhya Pradesh. The history of Chanderi has gone through many rulers, till it was transferred to Sindhias in Gwalior in 1861 by Huge Rose (1858-1861). The history of Chanderi started when the Ghyasuddin Balban captured the city in 1251 for Nasir ud Mahmud, Sultan of Delhi. Few years later Rana Sanga of Chittor established its capital at Chanderi and gave it to Medini Rai, the powerful wazir (Arabic term of Minister) of Mandu, after long ruled by Khilijis, mamluk's & Tugluk's in 1519. Years later Rajput's of Bundela incarcerated the city in 1586 and then came the time when Devi Singh was made a governor of the city. Chanderi is a rich town in terms of natural beauty and great culture infused by different kingdoms that ruled the region in the past. Some of the best places to visit in Chanderi are Babur's Mosque, Jauhar Monument, Khuni Darwaza, Jama & Juma Masjid, Badal Mahal, Jain Temple, Nizamuddin Tombs, and more. Festivals in Chanderi If you are very keen on buying the famous Chanderi sarees and similar fabric that the place is known for, do visit the town during Chanderi Silk Festival, which takes place almost every year. Visitors can buy wide range of items in this festival like designer Chanderi sarees, suits, fancy sarees, dupattas, and more. They can even get fantastic prints like bagh, baaboo, kalamkari, rapit, etc. that are the speciality of Chanderi. There is absolutely no problem of accommodation in Chanderi, infact one can have good accommodation facility throughout the city. There are many lodges, guest houses, and hotels in Chanderi to give tourists a comfortable and relaxing stay. Some of them are listed below. Shopping in Chanderi There are many shopping centres in Chanderi that sells incredible Chanderi silk sarees, salwar kurtis, brocades and muslin clothes. A lot of traders, designers, and Chanderi silk lovers visit this fascinating destination to buy their favourite fabric, which is found nowhere else in India. Some of the shops that you can visit during your exploration in Chanderi include, Anupam Collection Store, Nirupam Gift Centre, Metheran Market, etc. By Rail: The nearest railway station to reach Chanderi is at Lalitpur, which is approximately 40 km on Bina-Bhopal track. One can avail direct taxi or cab to reach their hotel or guest house in Chanderi from the railway station. By Road: Chanderi is well connected by road with other major cities like Bhopal, Gwalior, Khajuraho, and Delhi. 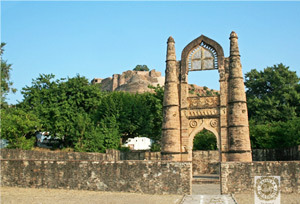 Tourists can take either bus or book a taxi to reach their desired destination in Chanderi. Madhya Pardesh has become an important tourism region in India and is visited by a large number of domestic and foreign tourists. Chanderi plays a great role in the heritage tourism of India and is more of a rocky destination with desert like areas, historic monuments, and archaeological sites. It has major attractions in the form of palaces, temples, etc. that can be best visited in winter between October and April as the climate remain pleasant and good at this time of the year.